Blue Gillette Blades vintage advertisement from 1951. 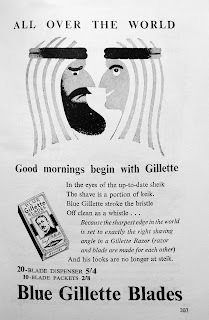 "All over the world good morning begin with Gillette". Seems like even then Gillette blades were the best: "Because the sharpest edge in the world is set to exactly the wright shaving angle in a Gillette Razor". The design of blades box looks so vintage, I can't believe it's from 1951.